The goal of tendon repair is to restore the normal function of joints or their surrounding tissues following a tendon laceration. Tendon injuries are widespread in the general adult population. They are more common among people whose occupations or recreational athletic activities require repetitive motion of the shoulder, knee, elbow, or ankle joints. Injuries to the tendons in the shoulder often occur among baseball players, window washers, violinists, dancers, carpenters, and some assembly line workers. Rowers are at increased risk for injuries to the forearm tendons. The repetitive stresses of classical ballet, running, and jogging may damage the Achilles tendon at the back of the heel. So-called tennis elbow, which occurs in many construction workers, highway crews, maintenance workers, and baggage handlers as well as professional golfers and tennis players, is thought to affect 5% of American adults over the age of 30. Women in all age brackets are at greater risk than men for injuries to the tendons in the elbow and knee joints. It is thought that injuries in these areas are related to the slightly greater looseness of women's joints compared to those in men. Local, regional or general anesthesia is administered to the patient depending on the extent and location of tendon damage. With a general anesthetic, the patient is asleep during surgery. With a regional anesthetic, a specific region of nerves is anesthetized; with a local anesthetic, the patient remains alert during the surgery, and only the incision location is anesthetized. After the overlying skin has been cleansed with an antiseptic solution and covered with a sterile drape, the surgeon makes an incision over the injured tendon. When the tendon has been located and identified, the surgeon sutures the damaged or torn ends of the tendon together. If the tendon has been severely injured, a tendon graft may be required. This is a procedure in which a piece of tendon is taken from the foot or other part of the body and used to repair the damaged tendon. If required, tendons are reattached to the surrounding connective tissue. The surgeon inspects the area for injuries to nerves and blood vessels, and closes the incision. Diagnosis of a tendon injury is usually made when the patient consults a doctor about pain in the injured area. The doctor will usually order radiographs and other imaging studies of the affected joint as well as taking a history and performing an external physical examination in the office. In some cases fluid will be aspirated (withdrawn through a needle) from the joint to check for signs of infection, bleeding, or arthritis. Prior to surgery, the patient is asked not to eat or drink anything, even water. A few days before the operation, patients are also instructed to stop taking such over-thecounter pain medications as aspirin or ibuprofen. If the patient has a splint or cast, it is removed before surgery. To prepare for surgery, the patient typically reports to a preoperative nursing unit, where he or she changes into a hospital gown. Next, the patient is taken to a preoperative holding area, where an anesthesiologist administers an intravenous sedative. The patient is then taken to the operating room . Patients are asked to have someone drive them home after tendon repair surgery. Healing may take as long as 6 weeks, during which the injured part may be immobilized in a splint or cast. Patients are asked not to use the injured tendon until the physician gives permission. The physician will decide how long to rest the tendon. It should not be used for lifting heavy objects or walking. Patients are also asked to avoid driving until the physician gives the go-ahead. To reduce swelling and pain, they should keep the injured limb lifted above the level of the heart as much as possible for the first few days after surgery. splints remain in exactly the same place. Medications prescribed by the doctor should be taken exactly as directed. Patients who have been given antibiotics should take the complete course even if they feel well; this precaution is needed to minimize the risk of drug resistance developing in the disease organism. If patients are taking medicine that makes them feel drowsy, they are advised against driving or using heavy equipment. Aftercare may also include physical therapy for the affected joint. There are a variety of exercises, wraps, splints, braces, bandages, ice packs, massages, and other treatments that physical therapists may recommend or use in helping a patient recover from tendon surgery. Tendon repair surgery includes the risks associated with any procedure requiring anesthesia, such as reactions to medications and breathing difficulties. Risks associated with any surgery are also present, such as bleeding and infection. Additional risks specific to tendon repair include: formation of scar tissue that may prevent smooth movements (adequate tendon gliding); nerve damage; and partial loss of function in the involved joint. Tendon injuries represent a difficult and frustrating problem. Conservative treatment has little if any chance of restoring optimal range of motion in the injured area. Even after surgical repair, a full range of motion is usually not achieved. Permanent loss of motion, joint contractures, weakness and stiffness may be unavoidable. Scar tissue tends to form between the moving surfaces within joints, resulting in adhesions that hamper motion. The surgical repair may also split apart or loosen. Revision surgery may be required to remove scar tissue, insert tendon grafts or other reconstructive procedures. Thus, successful tendon repair depends on many factors. Recovery of the full range of motion is less likely if there is a nerve injury or a broken bone next to the tendon injury; if a long period of time has elapsed between the injury and surgery; if the patient's tissues tend to form thick scars; and if the damage was caused by a crush injury. The location of the injury is also an important factor in determining how well a patient will recover after surgery. Mortality rates for tendon repairs are very low, partly because some of these procedures can be performed with local or regional anesthesia, and partly because most patients with tendon injuries are young or middle-aged adults in good general health. Morbidity varies according to the specific tendon involved; ruptures of the Achilles tendon or shoulder tendons are more difficult to repair than injuries to smaller tendons elsewhere in the body. 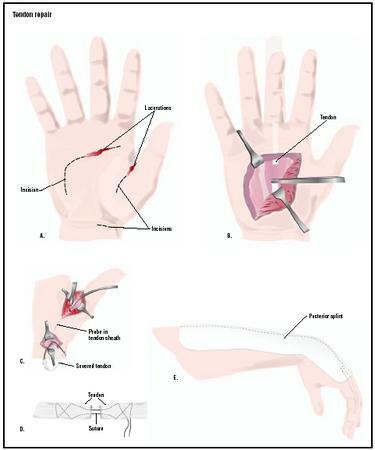 In addition, some postoperative complications result from patient noncompliance; in one study, two out of 50 patients in the study sample had new injuries within three weeks after surgery because they did not follow the surgeon's recommendations. In general, tendon repairs performed in the United States are reported as having an infection rate of about 1.9%, with other complications ranging between 5.8% and 9.5%. There are no alternatives to surgery for tendon repair as of 2003; however, research is providing encouraging findings. Although there is no presently approved drug that targets this notoriously slow and often incomplete healing process, a cellular substance recently discovered at the Lawrence Berkeley National Laboratory may lead to a new drug that would improve the speed and durability of healing for injuries to tendons and ligaments. The substance, called Cell Density Signal-1, or CDS-1, by its discoverer, cell biologist Richard Schwarz, acts as part of a chemical switch that turns on procollagen production. Procollagen is a protein manufactured in large amounts by embryonic tendon cells. It is transformed outside the cell into collagen, the basic component of such connective tissues as tendons, ligaments or bones. Amgen Inc. is planning to use genetic engineering to bring CDS-1 into mass production. Prolotherapy represents a less invasive alternative to surgery. It is a form of treatment that stimulates the repair of injured or damaged structures. It involves the injection of dextrose or natural glycerin at the exact site of an injury to stimulate the immune system to repair the area. Thus, prolotherapy causes an inflammatory reaction at the exact site of injuries to such structures as ligaments, tendons, menisci, muscles, growth plates, joint capsules, and cartilage to stimulate these structures to heal. Specifically, prolotherapy causes fibroblasts to multiply rapidly. Fibroblasts are the cells that actually make up ligaments and tendons. The rapid production of new fibroblasts means that strong, fresh collagen tissue is formed, which is what is needed to repair injuries to ligaments or tendons. See also Orthopedic surgery . Canale, S. T. Campbell's Operative Orthopaedics , 10th ed. St. Louis, MO: Mosby, 2003. Walsh, W. R., ed. Repair and Regeneration of Ligament, Tendon, and Capsule . Totowa, NJ: Humana Press, 2003. Assal, M., M. Jung, R. Stern, et al. "Limited Open Repair of Achilles Tendon Ruptures: A Technique with a New Instrument and Findings of a Prospective Multicenter Study." Journal of Bone and Joint Surgery, American Volume 84-A (February 2002): 161-170. Beredjiklian, P. K. "Biologic Aspects of Flexor Tendon Laceration and Repair." Journal of Bone and Joint Surgery, American Volume 85 (March 2003): 539-550. Forslund, C. "BMP Treatment for Improving Tendon Repair. Studies on Rat and Rabbit Achilles Tendons." Acta Orthopedica Scandinavica Supplement 74 (February 2003): 1-30. Harrell, R. M., Tong, J., Weinhold, P. S., and L. E. Dahners. "Comparison of the Mechanical Properties of Different Tension Band Materials and Suture Techniques." Journal of Orthopedic Trauma 17 (February 2003): 119-122. Herrera, M. F., G. Bauer, F. Reynolds, et al. "Infection After Mini-Open Rotator Cuff Repair." Journal of Shoulder and Elbow Surgery 11 (November-December 2002): 605-608. Joseph, T. A., Defranco, M. J., and G. G. Weiker. "Delayed Repair of a Pectoralis Major Tendon Rupture with Allograft: A Case Report." Journal of Shoulder and Elbow Surgery 12 (January-February 2003): 101-104. Weber, S. C., J. S. Abrams, and W. M. Nottage. "Complications Associated with Arthroscopic Shoulder Surgery." Arthroscopy 18 (February 2002) (2 Suppl 1): 88-95. American Physical Therapy Association (APTA). 1111 North Fairfax Street, Alexandria, VA 22314. (703)684-APTA or (800) 999-2782. http://www.apta.org . MedlinePlus. "Tendon Repair." http://www.nlm.nih.gov/medlineplus/ency/article/002970.htm . Tendon repairs are usually performed in an outpatient setting. Hospital stays, if any, are short—no longer than a day. Tendon repairs are performed by orthopaedic surgeons. Orthopedics is the medical specialty that focuses on the diagnosis, care and treatment of patients with disorders of the bones, joints, muscles, ligaments, tendons, nerves and skin. Can I expect normal flexibility in the affected area? What are the risks associated with tendon repair surgery? How many tendon repair procedures do you perform in a year? I had my FDP on my right small finger repaired. However, after the cast came off the repaired tendon snapped again. Now it has been almost 3 months since the initial surgery. After seeing 6 or so experts, half of the doctors recommend another surgery with a Palmaris Longus graft and the other half tell me to learn how to live with an unrepaired finger. I should say that this is in Turkey, and I am not sure what to do now. Any suggestions? Thanks in advance. I also have had surgery.Although mine is quite extensive and new,3 weeks.I had a serious injury to my R hand involving a grinder w/a rip saw attachment and that's what it did.9 of my 10 flexor tendons were cut ,along w/ my nerves and main artey.I can no longer afford the $ 230.00 an hour PT.So does any one have any feed back as what to do now.I have a special splint as well.Little or no mobility,w/one finger bent almost all the time. Any one? Please? Smallest Finger on the bottom had cut to the bone 20 years ago they just fix without tendon. I am 33 years old. It is a lust joint on the finger had cut, join bends free. Please let me know. Thank You. Valeriy. to know whether or not it is too late for surgery........can you let me know? On 29/6/10 I had a Cheilectomy operation on my big toe. My Tendon was accidently severed and operated on 3 weeks after to repair it. What range of movement should I be having and when? I cannot move my toe up or down now, I am very depressed about the situation. I got hurt at work.This girl at work was supposed to hold the door to a machine.Then she let it go and it smashed my rite hand.I had to have surgery and they had to connect 3 of my ligaments back together.It i very painful.Just wondering how bad it hurt my hand.Will i be able to lift heavy stuff again.And how long am i goin to be out of work. Hi. I had tennis elbow for 4 years now. It is work related repeditive strain injury. I had 2 rounds of physio before my tendent release surgery. After my surgery my arm was still sore, so my doctor sent me for me for more physio. Nothing seemed to work. I had a MRI done at the begining of the year it showed now that it is tendonois. The last bound of physio they told me nothing can be done. This is WSIB case so I ended up at the Evaluation Centre in Ottawa Ontario , they looked at my elbow and said must be bone chips. I was then sent for x-rays on my elbow that turned out to be normal. Lately my elbow feels like it's disloating when I use sometimes. I am in pain all the time, night or day. Not very much sleep , still working . I am on oxycodiens at night that don't touch the pain. During the day time I take tynole #3. This is no life...do you have any help for me?? i have a severed tendon , and a torn rotor cuff. i'm also 60 years old. would it be worth me having surgery if i can still use it . it hurts. but i do handle pain well. i do not take meds if at all possible. My mother in law is your age and was going through something silmilar. She ended up having the surgery a year ago and said she was so happy to have it done. She went through the pain for several years before having hers done. So i would suggest going to the dr. She also went to pt for awhile afterwards. I also had a tendon repair in my ankle today. I am 30 and work on an ambulance. Well the company i worked for didn't salt the parking lot and i fell. So i broke my leg in 02/09 and had surgery to get hardware in 06/09. Went the pt and i was still in pain. Well a screw dug a cavity into my bone causing a possible bone infection and had the hardware removed and antibiotics beads placed in 03/10. Then i had to go in for surgery to have the beads removed in 04/10. Started pt again...i had pain and told the dr. and they found bone spurs. So we had the shaved down this morning and he got in and found a tendon that was shredded. So luckly i was given a nerve block so i feel nothing write now. But I am not looking forward to tomorrow! Hope everything goes well for everyone else. i have qustion a few months ago i was messing around out back and was running and sliped on this plastic lid thing and flew elbow first into a car side widow and it broke.. it messed up my elbow i have scars but there is this lump on my elbow it feels kinda hard and when i push and move it lightly i can feel like little hard bumps in the big bump. i feel no pain from it most of the time but some times when i make certin movements or use my elbow to push my self up it will cause pain... any idea what this might be? tendon? nerve ending? im confused and am just trying to get answers thanks!! I just had surgery on my hand to repair a flexor tendon on Oct 22 today is Nov 20, I'm presently doing rehab on it and one of the exercises they are telling me to do is bend my finger with the other hand but when I do and try to hold the finger in the bent form it always rises no matter how much I strain, wondering if this is normal? hi jereme, my name is rab i am going in to hospital today for a cosultation on a snapped tendon on my left thumb on the last joint before the nail. It sounds similar to your problem, my thumb and forearm and elbow felt tingly. the early diagnosis was a snapped tendon,so after today i might have a better idea wot will happen. All the best with your problem. Over the past three months I have had a very painful foot - on the inside arch of my foot at the edge of my heel (towards the middle of foot). I had a sports specialist have a look at it, and he said I had torn my tendon and with regular exercises (which he gave me), it should start to get better. On October 8, 2010 I had a bad accident while getting my morning coffee. My husband opened the oven door (he was wiping it out after doing the clean thing the night before). Anyway, I tripped on the door, ended up sitting on top of the door, and as I came down the door and me (180 pounds) came down on my foot. It's the holidays so after going to a surgeon, I am trying to decide if I should have a severed tendon (the peroneus brevis tendon) reattached. I have an appointment coming up the second week of January and I really don't want to undergo surgery. Can this tendon heal on it's own? I am almost 63 years and already suffer from degenerative osteoarthritis in my knee and in this foot. I am retired and get around ok, but my mobility is already challenged from the arthritis in my left knee. Back in Feb. 2009 I was diagnosed with ripped tendons in the bottom of both feet. A foot doctor referred me to physical therapy which did not help. My questions is, will the tendons ever heal on their own or will I be in constant pain and have trouble walking forever? If the only way to repair the damage is surgery is there an organization I can turn to for guidance? The area I live in does not have a very good base as far as specialist go so any suggestions or help that you can supply would be appreciated. Thank you. I underwent a complete reattachment of my left quad tendon to the patella. I am now awaiting the surgeon's 6 mth evaluation to confirm if everything is good. I have not been able to drive my 5 speed vehicle since July 2010 when this occurred. Lots of physical therapy and good ROM, not sure about the force needed to drive clutch on a old vehicle such as mine. Original ER surgeon did a fantastic job and I do have a 7 " scar above the knee, but a good job was done. I need to get back to driving and employment as I have been out of work as a CNA/HHA since the accident which happened as I was stepping down with left leg on front steps of apt. It was horrifying to see the gap where the tendon layed vacant of the tendon and muscle, all bound up into my thigh and the pain was unreal. I went totally into shock that evening. I have a tear in my tendon on my left shoulder / arm and I have not undergone surgery yet, I am not sure if I will, has anyone had this proceedure done? hi sir im 32 yrs old i had achilles tendon cut and already operated last 16 feb 2011. my question why? until now may wounds still not heal and looks like have infiction? what antibiotic i can use co'z my doctor told me after my operation no need antibiotic. Hi, I had my right pectoral rupture, right above my arm pit. It happen on january 3 2011 and had my surgery on march 21, I have to wear a sling for six weeks total, I just started physical therapy and they are just doing passive movements. My question is how long would I take to fully recover and would I be able to do weight lifting again or any hard physical activity like grapping(jit jut sui)and would I have full ROM on my arm. I met with an accident in September 2008 in which I damaged the Tendon which lifts the Big toe,it got snapped ,I had a surgery on the same day but it failed as I had not followed the doctors orders,Now I referred it to the Orthopedic surgeon ,He suggested Tendon Graft and gives 60-70% chance of recovery,I want to ask if it is a safe option for graft and is there any other method to repair it? I am not able to lift the toe.please Help. hi, what will happen if i have to get surgery on my knee's? i was born with dubble tendons and my doctor says if my knee's keep popping i might have to get surgery. i dont know what will happen to me, im turning thirteen and im trying not to go crazy, please tell me what i should do and how long will it take me to recover? Hi, I have my ligament of knee torn and it happened 10 years ago. I can't run or jog because I get the pain in my knee after jogging so I just want to ask can it be perfectly fine after getting operation done having this problem from 10 years, now I want to get knee surgery done. I have a almost complete tear in my UCL in my elbow. I am a firefighter and am wondering would surgery or natural healing be the best option for me. I have been told that I may not have full range of motion in my arm if it heals naturally. Also it may not be as strong than it would be if I had surgery. Any thoughts? 7 years ago I think I ripped the tendon in my right little toe, can surgery still be done? What else can I do to get treatment ? Just two days ago I had an accident and my leg went through a glass door.. they told me I had cut through five tendons and a blood vessel I got surgery the same day on it they put me in a cast and told me to come back 1 to 2 weeks later.. I was just a little worried and wondered if I will be able to walk normal again? I had a work related injury that caused me to get tennis elbow in both arms. I received one shot of cortisone in my left elbow amd three in my right all within one year of this injury. My left feels fine and my right started to get better but than degraded. My doctor is recommending surgery. Does anyone have some first hand knowledge of the surgery and it's success rate? I hurt my achillies tendent after a back surgery in 1999. the only excerise i was allowed to do was walking. I did great, gradutally worked myself up to 4 miles in 2 hours. Took a break from walking for a couple of weeks. Than went instead of starting slow again I went back walking the 4 miles again, by the second day I could not make it home i was in so much pain.My husband had to come get me in the car.Had lots of theporty on my heel over the years .A couple of crotizine shots and was told there wasen't nothing they could do.I have had 3 knee replacement since than and my foot has goten worse.So this year my doctor who done my knee replacements finally sent me for a MRI on my foot. My Achillies tendent lit up on the E-xray as if it was arthritis. the doctor said he never saw inflammation show up on a E-Xray like that before.There was also 3 torn ligenents.He had me weare a brace for three months ,It helped stable the foot and cut down on the pain while i wore it except the brace put preasure on the achillies tendent and gave a pain every day.After three month I only weare it when I garden ,Walk, shopping for a long time or on my feet for long periods of time.If my foot pains I put it on.I see him in a couple of months and have to deside on surgery.Has any one have this kind of surgery? If so was it successful.How long before you were walking again? Lacerated dip flexor tendon in Index finger 8 years ago, can't bend tip of index finger, can I still get it repaired? My boyfriend cut his arm and severed all arteries and tendons. He had to have emergency surgery. He now has shooting electric shock like pains. Is this normal and what can be done to treat them? I just had bunion surgery two weeks ago and also had 2nd toe tendon moved to hold down my 2nd toe to keep it in a straighter position. (it was kind of hammer toe) Will the cramping feeling ever go and will I ever bend it again? It isn't exactly painful but is very stiff and swollen. Had a torn quad tendon repaired for second time. I am in a cast from upper leg to ankle. How much weight is safe to put on foot while using walker for stability. Been in cast 12 days. I fall down from the stairs and my knee are very painful. I could not sit long hour even while driving. Already went to the hospital ampang putri that recommended by the clinic. Twice the doctor jap at my knee but still no improvement until now. It started since last August 2011. Please advice. I lacerated (4 inches accross) my forearm yesterday and severed a flexor tendon (clean cut). I'm due for surgery on Tuesday. I will recouperate 100%. That's a fact. P.s. The only thing that is sore (bee sting) is the tetanus shot I got yesterday. I had tendon reconstruction on my right thumb at age 8 - over 35 years ago. I was never able to bend my thumb completely. Now I am starting to have more and more pain in my right shoulder and neck. Any chance that could be resulting from my previous surgery? I tore tendons off both knees in two separate accidents early 2012. Two seprate lots of surgery where I understand they reattached the quad muscles to the anchor points with carbon fibre. I was able to walk without the aid of crutches or a stick after about 4 months. I can walk unaided now 10 months after the surgeries but am unstable going on any downhill slope but this is improving.My knees are sore after any prolonged excercise.e.g I mowed two lawns today and did various other joibs that required walking, bending and lifting light weights.I need to be very careful whereI place my feet as any unexpected drop off may make me fall over.Originall injury was caused by a slip on a wet paver and I was being very careful at the time. I am 58 years old. Hi,today is my 6th weekof recovery after having and op on both my achilles tendons been cut but roof metal sheets ,ihave motion of my foot and toes.Does anyone know if ill be able to walk normal again.I have not been for therophy yet. I have surgery scheduled for tendon repair for my little finger Anyone know about what kind of cast I will have, will my thumb be free? I am having anxiety worrying about it. My Dr. is on vacation so I can't ask him. Thanks! chair fell over, and hit my shoulder. after going to the doctor for the six time he sent me to have an MRI. i have two torn tendons in my right shoulder. have a very hard time sleeping at night due to the pain in the muscle. i do not want to lose my job. so how long is recovery for me? i work out 5 days a week and dp Texas boot camp two days a week. I cut my extensor tendon 6 weeks ago and had surgery to repair it. My question is, Is it normal for the affected fingers to swell after the splint is allowed to come off? I am finding it difficult to bend my fingers again. I have been doing really well with therapy while I was wearing the splint 24 hours a day. I was told a few days ago to go ahead and take the splint off during the day, but sleep with it on. I'm just freaking out because the fingers are swollen again. Hi, My husband tore his rotator cuff 4 weeks ago at work. He is a carpenter for a large Tx university system. They are saying this tear has nothing to do with his job and that the arthritis in his shoulder is the reason for the tear. He had been working over his head for at least the last 13 years for this institution. So they have denied his worker comp claim saying this is not job related?? How can that be. I am reading that his occupation is one that is listed as those that suffer from this type of injury. I am at a loss as to how to proceed. Any guidance would be appreciated. Thanks so much for the help!! I had surgery for a torn ucl to my r thumb and 4 mths later had a second surgery due to the first one not done correctly according to the 2nd Dr. that the work comp ppl sent me to. After PT for the 2nd time they have discontinued my PT after 2 mths and my thumb barely bends but has rom. I also have the surtures that are dissolving causing pain and the area is still swollen . Is this all normal for someone who has had 2 surgeries on their r thumb? In 1978 during atheletic workouts in the play ground in India I fell on my left shoulder. Was diagnosed with tendon damage. After treatment I was able to resume my sports activity. I feel clearley that the two bones i.e. collar bone end and the arm bone appear to be moving freely and appear to be held by muscles only. Many times i feel tolerable pain but have a doubt that what will happen in the old age. As I exercise regularly and have pretty strong muscles in the shoulders. I am 60 years old. Can you suggest any treatment and remedy. I am living in Winnipeg, Canada. I recently injured myself in a fall,tearing the triceps tendon and some bone off the elbow ,my surgeon operated after 7 days when i got back into the country ,16 days later ,the incision is closed and the physio has begun ,i can bend arm about 45% and hopefully in the next 3 weeks ,then strength training ,having to miss gym is the worse part but getting the right arm back to normal is the most important thing. I have to have surgery on my left foot tendon I have a tear that happened at work while I was painting parts on the line workers comp has sent me back to work with sit down work only its hurts so bad just siting there the foot goes to sleep in that cam boot it takes two weeks to get approved for surgery its so much better off the foot completely I have to take pills for the pane is there away to get off work till the surgery going to work with crushes such a pane and that cam boot and how long off work after surgery will I be .timothy l Greene help thanks. I went to the hospital and was given 7 stitches and my tendon was severed. I work in retail how long would you recommend I rest it for? as I'm worried if I go back after just a couple of days it may split open again or take a lot longer to heal. Three years ago I cut the middle and pointer fingers on my right hand on a razor wire fence. I can't bend them but I do have full feeling. Is this fixable? Over a week ago my arm went through a single pane window and it sliced my wrist pretty good. I had surgery exactly 10 days ago, they repaired 9 tendons, and my ulnar nerve, and tied off my ulnar artery all of which were completely severed. My small and ring finger are still completely numb and I can barely move them. Will i ever have mobility in those fingers again. Will I be able to hold things in my hand again? and work normally as a dental assistant? When I was about 9 or 10 years old,I got a cut on the inside of my finger. At that age it wasn't a big of a deal because I thought it was just a small cut but now as I'm 21 it hasn't been able to bend for all those years. So I want to know if it's still possible for me to get surgery to repair it because sometimes I get problems when hold ing objects and a slight stiff feeling in the finger. I had foot surgery on Dec. 11, 2015. It consisted of removing a bone spur on my heel . The doctors had to clean up my tendon and then they anchored two barrels on the right and left side of my ankle to hold the tendon. I have been going to therapy for two months and I still can't put pressure on my foot. It is sore around where the barrels are still. What should I do? I got an injury on my left leg feet. Glass top of table cracked and fell on my feet giving me a nasty cut. Anterior Tibialis tendon is cut. But I am able to make movements as other tendons are intact. Now I could not decide whether I should go for surgery or leave it like this only. I am happy enough with the movement I am having. If I don't go for surgery, will the situation get worsened? Should I go take the chance of going for surgery? I had a cheilectomy and bone spurs removed on my big toe 2 years ago. My toe will not totally straighten out and will not touch the ground. This has effected my walking. I am now getting painful corns on the bottom of both my feet from not putting even pressure on my feet. The arthritis is already back in the operated toe. My toe hurts to bend it. A podiatrist said my ligament is too tight and needs to be cut. Another said for me to try orthotics. I spent $400 on custom orthotics that have not solved the problem. The cheilectomy recovery was so much harder then I thought it would be. I got an infection in the incision 2 weeks post op which I know delayed my healing. I am scared to have another foot surgery but know I need my big toe flat for proper walking. Anyone been through this? Suggestions? I am a first grade teacher and on my feet all day. I need 2 feet that work well. I am disappointed that I didn't get a better outcome from the initial surgery done by a foot surgeon at a well known orthopedic group in Philadelphia. Supposedly the best. Had surgery 7 months ago for torn tendons on the outside of my foot/ankle. My incision gets pain in it like someone is giving me a shot in it & my foot feels like it is asleep! Why?? I sliced my left baby finger to the bone when cutting a bread roll almost 2 years ago. Both tendons were cut so I had no movement in my finger at all. I had surgery the following day but only one tendon could be repaired. I recovered well and had no major issues with movement or anything but in the past few weeks I am getting a lot if pain in my finger and it sometimes locks and I can't move it at all!! It's a throbbing pain at the bottom of my finger where it meets the palm of my hand. Is this normal? It can get very bad at times. Hy i just had a tendon repair two weeks ago nd i walked a bit with it ,pls am scared ,if my walkin with it will cause another damage and how long will i stay witout walkin with d leg. I have been diagnosed with tibial tendonitis and arthritis on my left foot since last March. I have tried every conservative treatment ( ice, steroid shot, boot, platelet replacement, orthodotics, cast) for 9 months. I have been treated first with a podiatrist and now an ortho surgeon. I have now scheduled a surgery for next week and I'm getting very anxious. I am concerned with the after care. I am a teacher and I am curious as to how much time will I need before I can return.I am 51 years old and live a very active lifestyle. I am aware that I will be casted and booted for the next 12 weeks. I teach regular aerobic classes and am participating in this to return to my normal activities. Has anyone experienced a positive outcome from having one of these procedures? Thank you! For three years I've been unable to fully contract my pinky finger due to a cut in my flexor tendon. I've have talked to an Orthopedic doctor and he told it was beyond repair due to time, my question is can i transplant another tendon or can their be another alternative. I am right handed and this has affected for the worst. I've got a full thickness tear in one of my rotator cuffs in my shoulder. My job involves lifting and the problem is in my dominant arm. It's been this way for years now but also my other arm is also feeling the effects of transferring most of the lifting load to that arm of which I've had a steroid injection in, to no avail. So basically I suffer with both shoulders. I am now endeavouring to strengthen my shoulder (the one with the damaged rotator cuff) through excerises but find when I lift my shoulder doesn't move correctly I can no longer straighten my shoulder and therefore can't lift how I'm supposed to. I would like to know whether persistence and determination will help or no matter what I do, I'll not be able to lift properly due to fact that the tendon completely torn? Hello. I had tendon repair surgery on 2015 at md university. It was after my accident i hit black ice and my truck rolled i remember waking up to it rolling few times. The last roll my hand alo ng with my head went out the drivers busted window. Well the truck rolled onto my hand and for arm. When it stopped rollin i jumped out a window.later while waiting for ambulance i thought id just broke it because the ring and middle finger bent all the way back towards the back of my hand where it was cut.i remember having to hold them down.if they were let go they would bend backwards again.ill never forget it a d having to hold them down without letting go wrapping my hand tightly in my sweater. Well when the light hit it at a house i ran to for help there was so much blood everywhere. It was a busy night that night with the roads being bad and i had to wait 20mins for a ambulance. Literally feet away from my parents home. I choosed not to run homw because i was in such bad shape and my kids were there. I was on my way home from working a double and 2 jobs that day.anyways Was flown in a helicopter to MD University trauma unit. After mri and xrays it was known when the truck rolled onto my hand and arm it it cut every tendon in my hand and muscles along with nerves n so forth. While asleep all i remember is being brought off the helicopter onto the roof top. When i woke up i saw some family and was right back asleep. After that i woke up from surgery 6hrs long and in the worse pain i ever felt in my life and never want to again. I did PT for few months and was behind in movement due to my therapist not being aggressive enough. So i quit going i do not have full use of my hand and i never will i guess. I can barely make a whole fist cant lift 2 of my fingers anf cant lift anything heavy at all. I drop things alot because i do not have full feeling of my hand due to having severe nerve damage. Also the scar tissue never broke :( and i still have a knott im guessing its where the tendons were sewed back together. But my only advice to many is make sure you see the right surgeon. Tendon repair is hard and not performed by just any surgeon. Also do much PT as u can and even when ur not at PT try and do a few things at home or at work to improve movement. I did it all and unfortunately i still dont have a normal hand or fingers. But i was thankful enough to have been flown to the right hospital because my surgeon knew tendon repair and he did a great job. I do have a ugly scar from it but im thankful to have my hand i may be partially disabled but im lucky to be alive ny seat belt saved me and fast thinking of wrapping my hand up with exspossed tendons. I lost alot of blood by time a ambulance came and what i did helped in the end. Goodluck to anyone who has tendon problems! calista, looks like nobody answers comments here. i also just had FT surgery, if numbness and pain in palmar part of thumb and index, that means damage to median nerve, if other fingers that is ulnar or digital nerve. google "anbp herbs" from a study on NIH website, order all 4 from amazon. also get colloidal silver with high PPM count, i can testify that silver will restore nerve function (i had frostbite multiple times, restored 100% feeling from zero). Nerves regenerate, nerves use AcetyCholine. Choline is found in beef liver, salmon and chickpeas (garbanzo beans). garbanzos are cheap, im eating a few cups per day. I had a tendon repair two years ago where they put a screw in. I have experienced a lot of pain and the doctor has now recommended taking the screw out. What are the repercussions of taking it out? An Achilles tendon injury can happen to anyone, but it can solved every soon... orthofeet Verve – Fuchsia is the best way of solving this problem…. This orthofeet verve-fuchsia provide more relief and relax to your legs which makes walk with more confident. Most people are using orthofeet shoes because it is also one way medicine to our legs. In this article is missing some important information as: "Imaging tests, such as Ultrasounds and MRIs, can also help diagnose the precise cause and location of the tendon injury" mostly when it has a laceration (cut). [I think on diagnosis/preparation]. -- I don't like blurred vision on some surgery. If you see it is helpful, we have to comment to others, before this 1/2 way procedure comes to someone close to us.